Islamic jewellery has traced a long journey from the beginning of the 9th century to the contemporary times. Islam encouraged both men and women to wear jewellery that was more impressive for its design and crafting than its gems or material worth. Islamic jewellery has often been quoted as the last word in refinement. The finesse of the design and the accuracy of the cut of the stone is the mark of a brilliant Islamic craftsmanship. The jewels often imbibe auspicious letters in a background of marvelous motifs and intricate tender designs famously called the Arabesque pattern. Islam believes that jewellery should be within the limits of not being too flashy or jarring. 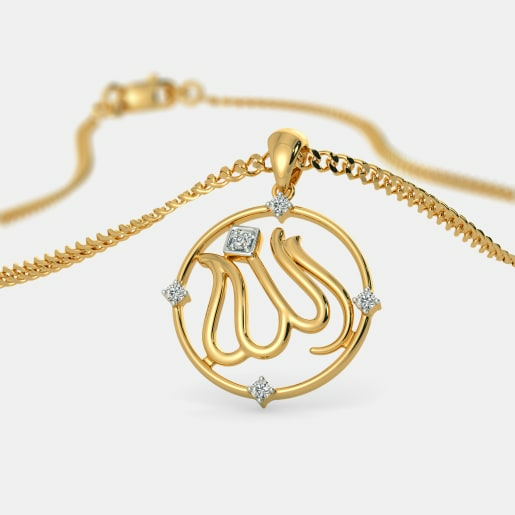 Subtlety and simplicity are the key theme of any Muslim pendant design. The designers at BlueStone has gone back in time and crafted jewellery that could be adopted into your daily life and that enraptures the essence of the days of yore and the message that was encapsulated with it. 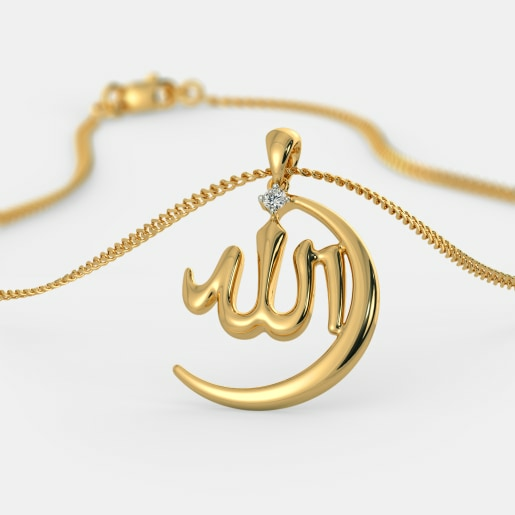 Standing aligned to such ideology, we bring you an exquisite range of Muslim Pendant designs. Feeling life to be unfair, meaningless and often too chaotic? Do you need some spiritual respite? Come drown in the sea of devotion and enrich your wardrobe with these Muslim Pendant designs. Imbibe the teachings of Allah and the word of Islam. Our range of Muslim pendant designs surely won’t disappoint you. The Esma pendant in an Arabesque design showing off intricate tendrils entwined in the background of the pendant. It could be said to be the most ornate one of the entire lot with its beautiful gold and diamond work. It exudes purity, something that would be a constant reminder to be pure to oneself and others, in terms of thought, word, and action. 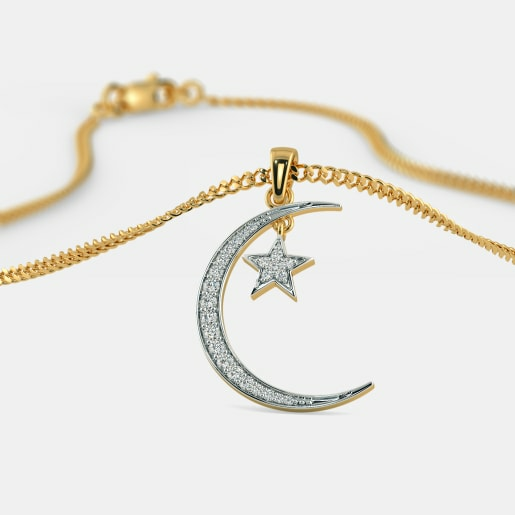 The Roshini Pendant denotes the most popular symbol of Islam- the Star and the Crescent, which has made way from being the centre piece on mosques to many nations’ flags. It represents the calmness and piety of the religion. The pendant is engorged with these symbols made with soft diamonds. Ward off the negativity from your life and stick to the holy, peaceful way of life as instructed by Allah. Our pendants may not help you do that but they will surely help you keep your gold closer to your heart, literally. The Shumayl Pendant signifies the ‘completeness’ in life. It is a stunner with its two parallel loops and diamonds embedded in the bigger loop. The Shumayl Pendant is made of gold and embellished with diamonds which adds to its appeal. The symbol for Allah on your neck will help you flaunt your spiritual inclination in style. The Fadheela Pendant for women borrows its meaning from the word fadheela which means cultured, refined and virtuous. BlueStone has unisex jewellery in Muslim Pendants like the Afoze Pendant and the Murabbi Pendant. 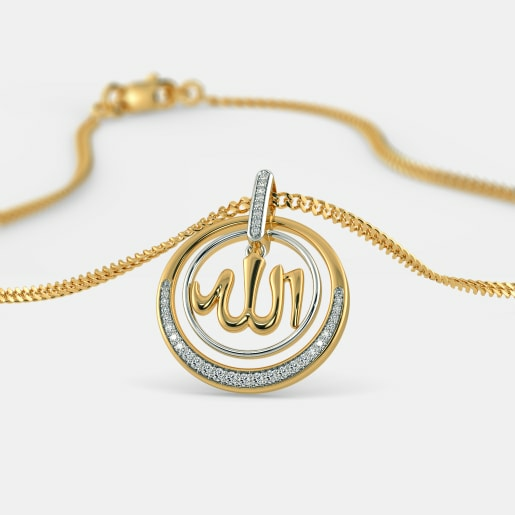 Their elegant capturing of the word Allah portrays sheer piousness and a minimalistic glow to the jewellery. Both pendants come in gold marked with a single stone diamond in the centre. So wait no longer, come take a bow in devotion and buy Muslim pendants online exclusively at BlueStone. Our Muslim pendant prices could only be god granted! Avail our offers like home try-on offer which makes your purchase at BlueStone easy. If by some chance, you feel we haven’t lived up to your expectations, we also have the 30-days money back and the lifetime exchange offer to make it up to you. So hurry and shop now from our trendy yet traditional collection of Muslim Pendants.